Voice-controlled devices continue to grow more impressive by the week, and in the latest development, today Amazon announced that its Alexa voice assistant service will soon be able to help out in the kitchen. Specifically, when you need to have something heated in the microwave or oven in the future, you could simply say, "Alexa, heat this on high for one minute." In addition, you could ask Alexa to preheat the oven to 450 degrees. The tools are available from Amazon for developers now, but we'll still have to wait a while to see compatible appliances. The catch, as you might imagine, is that your ovens and microwaves need to support this feature, and almost all "smart" versions currently don't. They'll either need to be updated or built from scratch entirely. Ovens and microwaves are the current focus, but Amazon hopes that other appliances will be compatible beyond that. Only Whirlpool has officially made an Alexa skill for ovens and microwaves at the moment, but we have no timeline as to when we'll actually see an Alexa-capable oven or microwave from the company aside from "soon." In the future, though, Samsung, LG, GE Appliances and Kenmore will also allow their ovens (and, in time, other appliances) to support Alexa. The feature seems especially useful if you're in a busy kitchen with your hands full. It also might be useful for when you've put your food in the microwave and are reading the back of the box for directions, which you can then call out to Alexa as you find them. 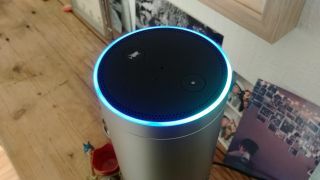 Then again, for more familiar items, it's worth wondering if voice commands will truly be that much more efficient. Even with current technology, it's generally already quicker to set an oven or microwave by hand than it is to call out directions. Plenty of other appliances allow for a connected home, as you'll discover in our guide!